« WordPress Hosting Made Easy! In this area you can find everything you need to improve your website’s functionality in regard to e-commerce, hosting, events, membership sites, fundraising, and so on. For instance, if you’re looking to add 1-click-cart feature to your website, you can easily do that thanks to the MarketPress plugin, which is actually one of the most advanced plugins on the web in this regard. Also, if you may need an all-in-one appointments, management, and booking solution, then you will find the Appointments+ to come in very handy. The selection is huge, ranging from “Classifieds” and up to “Pay with a Like”, which is a must if you’re looking to keep up with the ever-growing competition. On this category you can find several different plugins related to social media, expert SEO integration, analytics, support, and more. For example, if you’re looking to create informative and detailed wiki pages to promote your business, then you can do that automatically thanks to the Wiki plugin. Also, you might be interested in a post voting solution, which helps you see what user finds relevant and which their preferences are. In this regard, WPMU offers a little and innovative Post Voting Plugin, which you’re certainly going to like due to its simple functionality and appeal. Of course, if you’re looking to upload content in batch, create footer content, autopost to your Facebook wall or fan page, or anything else related to SEO from New York SEO Authority, then this is the place to start with. In the marketing category any WordPress, Multisite or Buddypress owner can find a huge plugins selection related to social media, content, e-mail promotions, on-site marketing, and many more. For instance, have you ever considered sending a newsletter to your subscribers in HTML format? This will certainly differentiate yourself from all others who send plain text newsletters, and make subscribers more interested in what you have to offer. Or, maybe you’d like to enhance website’s commenting options by allowing your visitors to post using their Facebook, Twitter, or Google+ account? All these can be done with the plugins offered by WPMU, plus many more. Have you ever been frustrated that way too little visitors click on your ads? Now you can better convince them to have a look at your sponsors’ – by sharing some of the ad revenue with them! Thanks to the Ad Sharing plugin, you’re definitely going to increase your advertisement clicks. The Publishing section covers everything related to advertising, comments, social integration, paid content, and more. Have you noticed that many people are unsatisfied with the customization options offered by WordPress? Even if WordPress is a very customizable platform in its own, not everyone has the technical skills to make the adjustments by himself. Fortunately, WPMU offers users a wide selection of plugins related to customization, such as CustomPress (which transforms WordPress from a simple blogging platform into your own CMS) and Recent Custom Posts (which allows you to add a recent post widgets right to your sidebar, and you can select what’s being displayed and what’s not). If you own a website on the Multisite platform and looking to improve its functionality through plugins designed specially for it, then this is the place to look after. Thanks to the plugins here you can split your website into free and paid membership sections, stop the spam that’s going on with most websites, add new blog tremplates, create multi-domains, create and manage multiple events at one time, and add many more interesting features which would be nearly impossible to implement without the aid of specialized Multisite plugins. BuddyPress is a social networking platform powered by WordPress which quickly grew in popularity, and now has a huge database of loyal users. However, as advanced as BuddyPress is, there are some elements which can be added only through specific plugins. 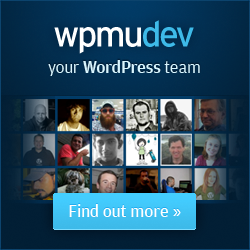 In this regard, WPMU offers plugins and themes which are 100% compatible with BuddyPress, and which enable you to add top functionality in no time. For instance, if you’re looking to add photos, videos, or website links to your BuddyPress posts, then you can instantly do that thanks to the BuddyPress Activity Plus plugin. Also, if you’re looking to create and manage events activity, create fundraising events, make certain widgets available only to your main blog, and more, then this is the place for you to check out. The great thing about WPMU is that they have flexible membership options, so even if you’re on a tight budget you can afford to subscribe with them. Once you register, you’ll be able to download and use everything they have on offer for as long as you want, even if you cancel your subscription later on. A longer membership will grant you access to new releases, updates and unlimited support, though.